This article was originally written by one of our good friends and fellow Nova enthusiasts, Marlin Spotts. We are happy to archive it and make it available to a wider audience. Published with permission. Was the 1970 Yenko Deuce Nova built with SCCA (Sports Car Club of America) Trans-Am racing in mind? Did Don Yenko have a secondary motive for this particular combination? These are certainly not the first things to cross your mind when you think about Yenko Deuce Novas. But could it be? Follow along for a circumstantial case that supports the possibility of the Yenko Deuce Nova being designed with SCCA racing in mind. There is certainly a precedent of Yenko building SCCA prepared cars. We have been somewhat conditioned to only think of the drag racing activities that the Yenko cars were most famous for. After all, the ’69 Yenko SC 427 Camaro driven by Ed Hedrick won the NHRA Super Stock title in ’69, and many a local drag strip had a Yenko Camaro, Nova or Chevelle as the resident Superstar. What many forget is that the monogram sYc really stands for Yenko Sports Cars Inc. which was contrived in ’66 as a separate division within Yenko Chevrolet in order to ‘manufacture’ Corvairs to race in SCCA in ’66 & ’67. So the very conduit by which all of the Yenko cars were ordered, delivered and sold was initially designed to put Yenko cars on the SCCA tracks of America. These Yenko ‘Stinger’ Covairs were quite successful in SCCA, and still race in that series to this day. This precedent spread to other models. The practice of offering products for SCCA racing continued in 1967 by including sYc Camaros along with the Corvairs. Most know about the 427 transplanted into the Yenko Camaro, offering the solid cam version with the 4 speeds and the hydraulic cam version with the automatics. However, Yenko also offered another sYc Camaro known as the ‘Stormer’. The Stormer was essentially a Super Tuned Z28 that was to be raced in ‘A Sedan’ in SCCA, and in ‘Group 2 Sedan’ in FIA. The Stormer was advertised as a Z28 with ‘Exclusive Track-Designed Suspension’, special shock absorbers, special sway bar, Corvette disc/drum brakes, and several other hi-performance exclusives for a base price of $6,000. (You’ll see some of these descriptors on the Yenko Deuce Nova). So, if the Nova would get noticed simply for being a ‘Nova’, where does the Boss 302 Mustang come in? The Penske Camaro won the SCCA Championship in ’69 and the Boss 302 Mustang was the car to beat – and many would argue was actually the better car. The Penske Z28 likely won races more because of Penske’s innovations – not to say the Z28 was a slouch, but the Boss Mustang was a formidable contender. If one was to get noticed in this series the Nova would need to run with the Boss, so Yenko need to design his Nova with significant Trans Am potential. Competition aspects related to COPO 9737. Next would be the chassis and suspension. COPO 9737 was used on several Yenko models, and its origins actually date back to the ’66 Corvair. Technically, COPO 9737 was termed by Chevrolet as ‘Sports Car Conversion – Yenko’. This COPO changed each year depending upon the model it was being applied to, but in general this COPO was for non-engine related items, special suspension and 140mph speedometers on the ’68 & ’69 Camaros, 15” wheels from the Z28 on the ’69 427 Camaros – a variety of things. For 1970 the elements of COPO 9737 were modified in a way that supports the possibility of an SCCA type Yenko Deuce Nova, these modifications included several items. One of the items Yenko termed “Custom Designed Trans Am Suspension” on the Yenko Deuce literature and window stickers, and was reminiscent of the Stormer Camaros. What Yenko did was include option RPO – F41 Sport Suspension in COPO 9737, which was necessary because F41 was an SS only option. The F41 option was essentially bars and shocks (not springs), and included a 13/16” front sway bar, and a unique rear sway bar that was ‘hung’ via two bars that attached to special brackets welded into the floor pan above the cross flow muffler. 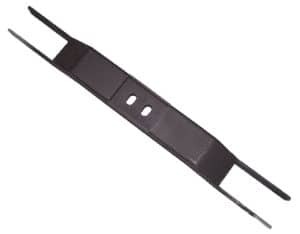 This 5/8” rear sway bar’s functionality came via special lower leaf spring brackets having an extra ‘ear’ that connected the ends of the sway bar to the rear through rubber bushings. The ‘Custom Designed’ nomenclature likely applied to the springs that were computer selected based on the option combination, consisting of standard ‘EL’ coded coils up front and ‘BK’ coded 5 leaf rear springs. In ’70 a 3.55 gear was the lowest ratio available, necessitating COPO 9737 to substitute the special 4.10 gears in the rear. This also required a special .833:1 gear reducer inserted between the tail shaft of the transmission and the speedometer cable in order to maintain accurate calibration. The original order form from Yenko to GM notes that the Yenko Deuce would start with the wide ratio Muncie M20 transmission. COPO 9737 provided the upgrade to the close ratio M21 – better for keeping the rpm’s up in the power band between gear changes. The stock Muncie 4 speed shifter in a ’70 Nova was not exactly what you would want if you were running a road course. So Yenko utilized COPO 9737 to have GM attach a ’69 Camaro Z28 Hurst shifter mechanism to the Yenko Deuce Muncie M21, and then finished it off with Pontiac GTO bench seat arm #4177. Yenko left the Muncie shifter in the big block ’69 Yenko SC Novas making this the only Nova ever to come directly from GM with a Hurst shifter. So, if the Nova was different enough to get noticed, built with Trans Am potential and street appeal in mind, how would it stand out visually? Look at the peer group. The Challenger T/A had a tape stripe on the side that concluded with the ‘T/A’ designator on the quarter, and a unique dual snorkel hood scoop. The AAR Cuda also had a neat strobe stripe down the side that integrated the ‘AAR’ designator, and a special hood scoop. The Boss Mustang had a stripe design down the side with ‘BOSS’ callouts built in, and actually incorporated the special shaker hood scoop into the stripe, (seeing a trend here?). Why mess with a good thing, if Yenko wanted the Trans Am look for the Nova – go with a proven look, and try the Boss design on for size. And why not, it wasn’t the first time a GM product took some design clues from a Mustang, think Camaro platform or the Pontiac Trans Am (and Stinger Corvair) with it’s very Shelby GT350 looking paint scheme. But who would think the Yenko Deuce Nova and the Boss Mustang are remotely similar? A visual comparison provides compelling support. While Yenko had GM build the foundation, Yenko Sports Cars added the look (in typical frugal fashion) with dealer add-ons noted on the brochure and window sticker. Hood Scoop. The Boss had a cool flat black shaker hood scoop. Yenko countered with his own type of hood scoop by essentially following another existing idea – call up George Hurst for some of his parts! Yenko utilized the hood scoop from either the Hurst Jeepster Special or the Hurst AMC Rebel Machine (still under debate) for the Yenko Deuce, and it fit the Nova hood quite nicely with its integrated hood tach. Hood Tach. 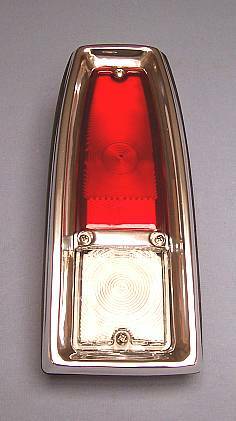 The Boss hood tach was a Dixco HT/x unit that had the FORD oval embossed on the bezel. Yenko broke with his tradition of installing Stewart Warner tachs and went with the exact same tach, but had Dixco emboss the YENKO crest on his bezel. This tach could be bought with the HT/x bezel and was also an accessory part for the Mopar guys, with their version embossed with the Pentastar. Side Mirrors. The Boss had stylish bullet mirrors. Yenko offered a pair of Talbot style mirrors that were quite popular from Shelby Cobra fame, but went with the Hurst Olds / Hurst Scrambler version in flat black. Wheels. The Boss wheels were fancy chrome mags with black inserts. Yenko decided to add mag wheels too, and swapped out the factory 14×7 steel wheels for 14×7 Motorwheel Magnum 500 Custom wheels. Yenko did not choose the Deluxe Chrome version – although a better match to the Boss – as they were more money. The Custom version in silver paint with black inserts, (sans trim rings), would suffice. These wheels were the same as GM Super Sport wheels and could have been installed by GM, but Yenko chose to purchase them directly from Motorwheel (cheaper) and have the tire shop across the street from the dealership change them out – but only 4 of them, you still got a painted spare. A ‘Y’ centercap decal covered up the Magnum 500 insert. Steering Wheel. The Boss had a nice 3 spoke steering wheel while the Nova came with a thin hard plastic wheel, not very fancy and certainly not suited for holding turns. Yenko’s upgrade was a steering wheel utilized the Buick GSX wheel. This steering wheel had a thick cushion grip that would stick to your gloves, 3 spokes of nice brushed steel, and a chrome horn button. Rear Spoiler. The Boss had a nice ducktail spoiler incorporated into the trunk lid plus a pedestal mounted spoiler, typical of Trans Am cars. Yenko knew better than to design and produce his own glass decklid with integral spoiler as he had done with the Corvairs and a few of the ’68 SC Camaros, and decided to install Cal Custom Twin Rear Spoilers. These were likely more look than function, but they helped accomplish the Trans Am look. Stripe Design. Nothing visually stands out more on these Trans Am cars than their stripe designs. The Boss utilized a flowing design that began at the leading edge of the hood, up the center, incorporated the hood scoop, then spread out towards the fenders, wrapped down over the sides with space for the BOSS 302 callouts, and then swept all the way to the back of the car. Yenko essentially copied this exact stripe design for the Yenko Deuce Nova. If you were to park a Boss and a Deuce driver’s door to driver’s door, what would it look like? The same flowing stripe design from the Boss is simply reversed on the Deuce. 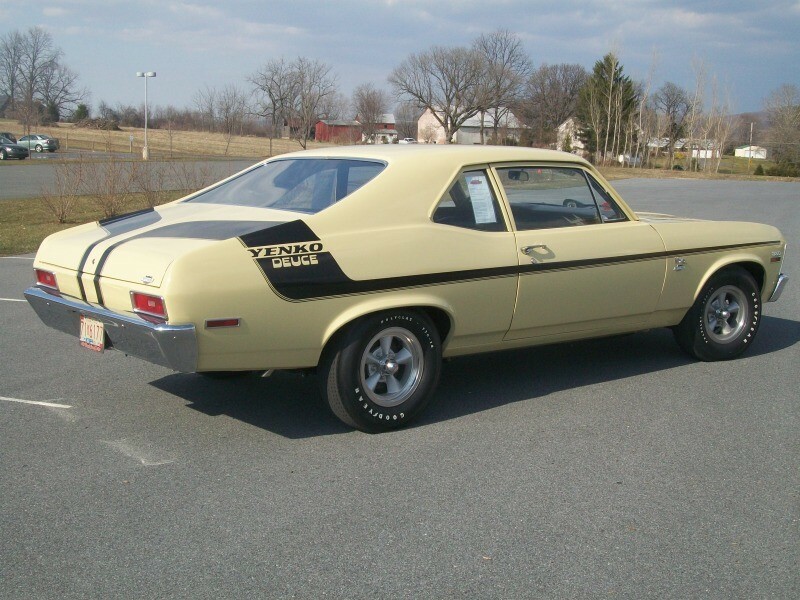 In fact, I believe that Yenko initially intended to install the Deuce stripes the same way as the Boss. Several years ago a very early Deuce advertisement surfaced that indeed had the stripes installed Boss style. I surmise that the look was just too similar to the Boss, and the stripes were flipped end for end and hood stripes added to the Deuce with the LT1 callouts. The package was complete when Yenko added his signature crest emblems on the fenders and decklid, along with door panel decals. If you add up all of these clues, then why no official Trans Am Yenko Deuce Novas? Well, there was a production requirement of 500 units, and although the first wave of Yenko Deuces sold well, there really wasn’t a huge market for $4,500+ Novas. There was no way Yenko was going to meet the production requirement, as just 175 were actually produced. Additionally, by ’70 Yenko was having credibility issues with the various sanctioning bodies, so there was not much chance of creative car counting as a solution. Without SCCA acceptance, the Yenko Deuce was going drag racing like the prior year sYc models, however the NHRA had enough of the creative car counts as well and would not even respond to Yenko’s repeated classification requests – leaving the Deuce to compete in the Modified Production class. No matter how many similarities exist between the Yenko Deuce Nova and general Trans Am spec’s or Boss Mustang specifics, it’s logical to be skeptical of this proposition. But many a court case has been decided on circumstantial evidence, so is it too much of a stretch to think that Yenko Sports Cars might have been planning a Nova for SCCA Trans Am racing?